ENGLISH: It is customary for Cubadisco to officially begin with an inaugural concert, and this year's event was at the Sala Avellaneda of the Teatro Nacional de Cuba. It featured the various works by Juan Formell and Adalberto Álvarez performed by the Orquesta Sinfónica Nacional arranged and directed by Joaquín Betancourt Jackman, with several special guests including Alejandro Falcon. You can view my scanned copy of the programme, which did not survive the trip home unblemished, here. Still photos don't convey the motion in the orchestra, but there were moments when members of the string sections were dancing in their seats. 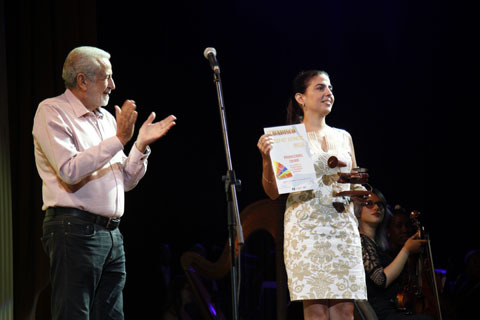 During the Gala, Jorge Gómez, President of the awards committee of Cubadisco, presented Carole Fernández, Director of Colibrí, with a Premio de Honor in recognition of Colibrís 15th anniversary. 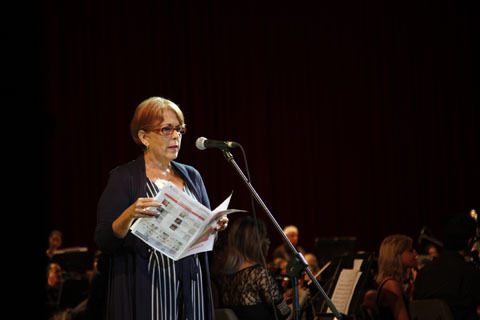 ESPAÑOL: Es costumbre que Cubadisco comience oficialmente con un concierto inaugural, y el evento de este año tuvó lugar en la Sala Avellaneda del Teatro Nacional de Cuba. La gala ofreció diversas obras de Juan Formell y Adalberto Álvarez interpretadas por la Orquesta Sinfónica Nacional, arreglada y dirigida por Joaquín Betancourt Jackman, con varios invitados especiales, incluido Alejandro Falcón. Puede ver mi copia escaneada del programa, que no sobrevivió al viaje a casa sin manchas, aquí.